Squishy circuits combine two of my kids’ favourite hands-on activities: play dough and electric circuits. 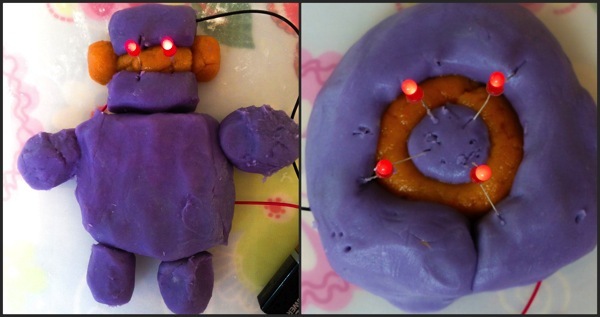 You can either just use conductive play dough in your circuits. Or, to extend the learning, you could mix up a batch of insulating play dough that doesn’t conduct electricity. Mix all the ingredients together in a pan on the stove over a medium heat, then knead to form a dough. For more detailed instructions and other useful tips, head over to StiMotherhood. Mix all the insulating play dough ingredients together in a bowl, then knead. Warning – this batch will be stickier than the conductive play dough. 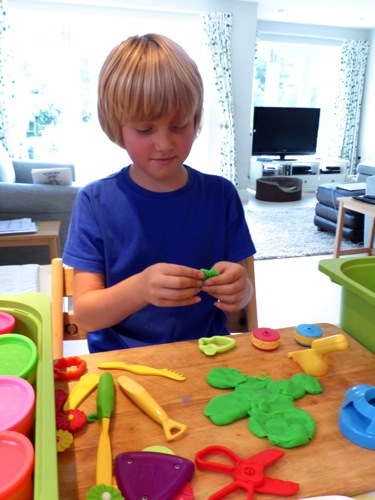 To play with the dough, you will also need a 9V battery and a battery holder with connecting wires, and some LED lights. 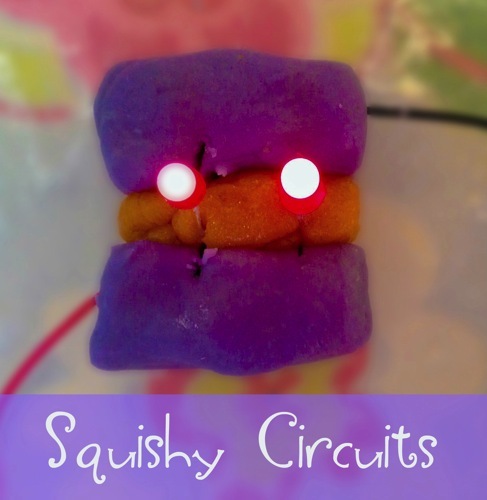 Before they play, show your kids what to expect and get them excited with this squishy circuits video. 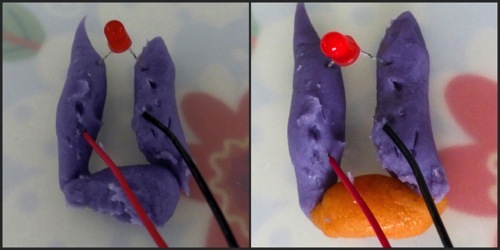 Squishy circuits provide a perfect demonstration of how electricity takes the path of least resistance. If an electric current has to travel through an LED bulb to complete a circuit, it will do so and light up the bulb. But if the electricity can find an easier path (like through a piece of conductive dough), the bulb will remain unlit. 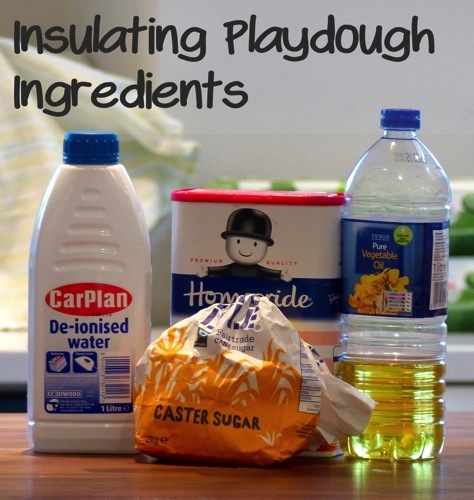 Use insulating dough to bridge gaps between pieces of conductive dough. Electricity can’t travel through the insulating dough. Instead, it has to travel through – and light up – the LED bulbs. I have a habit of seeing a cool activity online then gathering supplies and diving in without referring back to the original instructions. Which is why we first tried to power our squishy circuits with a couple of AA batteries. Underpowered circuits are a bit of a dampener on kids’ enthusiasm. 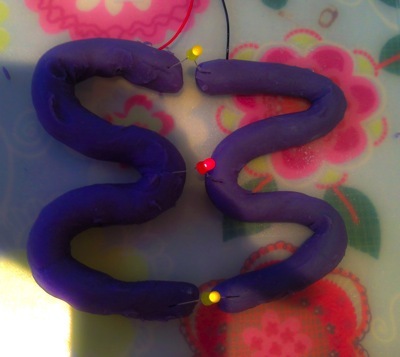 Luckily J(9) and C(11) were happy to switch to regular play dough and reconvene with the conductive sort on another day, once I’d bought some 9V batteries. AA batteries are probably fine if you have enough of them (and sufficient battery holders), but I’d recommend using 9V if you can. Finally – do wipe down your metal wires after they’ve been in contact with the conductive play dough, so they don’t rust. I first came across the idea of squishy circuits at StIMotherhood. 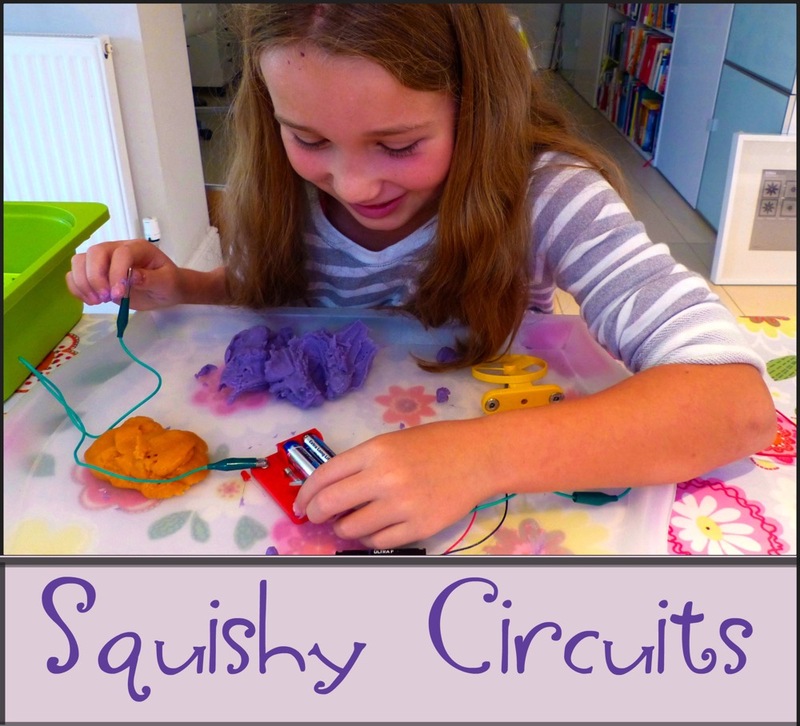 Do head over there for tips on how to get the most out of squishy circuits play. And see this great TED talk all about squishy circuits by the lady who invented them. Fun science – What dissolves? Hands-on science – Is light a wave or a particle? A note to my kind friends who are wondering what became of my next post about our Spanish adventure: This week someone with a huge Facebook following (I wish I knew who) shared my elephant’s toothpaste post, resulting in 70,000 extra visitors here. 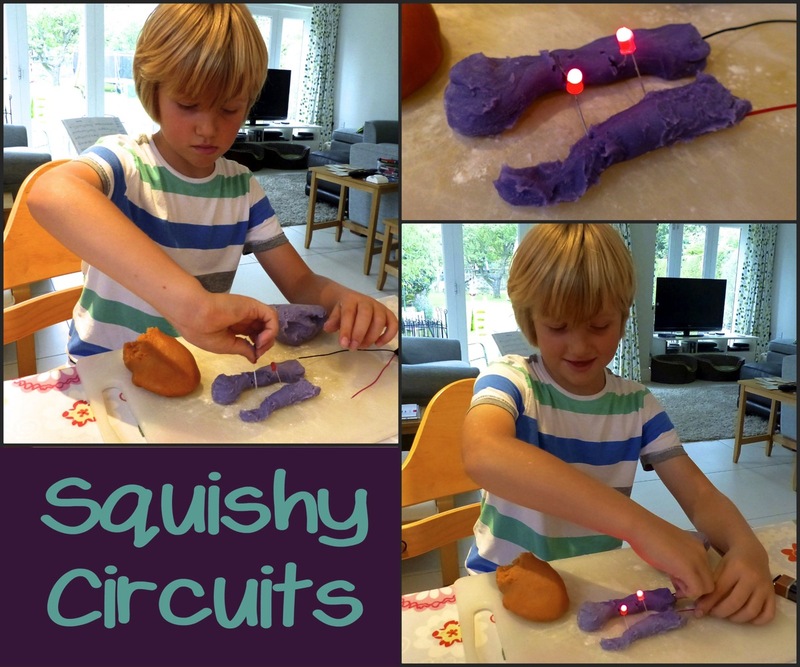 Once I’d picked myself off the floor, I was inspired to get around to finishing this post on squishy circuits. How cool! I didn’t know that you can change the conductivity of playdohs by changing the ingredients they are made from. It seems to be a case of, the more I learn, the more I realise that I know very little! 🙂 Also thanks for sharing the lessons that you’ve learnt. They’ll certainly save me a lot of time when we try this experiment. Thanks for sharing this post. 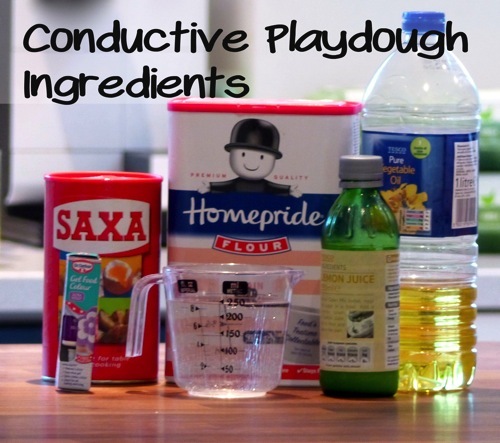 I knew you could change the conductivity of play dough and now I know how! I use distilled water for making red cabbage dye as an indicator for acids and bases as tap water can give slightly odd results. Deionised water is slightly different from distilled but would probably work as well. Thank you so much for the info about distilled water. It must’ve come up on an Amazon search and I just assumed they were the same. I have so much to (re)learn about chemistry! Thanks, too, for the tip about red cabbage indicator. I’ll try using some of our stock of deionised water next time we mix up a batch of that. That’s an awesome experiment!!! I’ve never seen that before. Congrats on the huge influx this week! That’s wild! Have a great weekend and thanks for sharing this cool experiment! Thanks, Jen. I hope you’re having a great Easter weekend, too! Oh my goodness! My boys would absolutely love this activity. Thanks for sharing! I hope your boys have fun with it, Tara! This play doh is such a neat idea – I have a slew of new nieces and nephews (who aren’t teens and therefore think everything I come up with is fun) that I’m sure will love this – can’t wait to try this out! I’m looking after my 4 year old nephew once a week this term. I’m so excited, I have a long list of fun, messy projects to play with! I bet my older kids will join in too. I have seen this sort of thing, but I have never done it. This is a wonderful post to refer to. Thanks for linking it up to Science Sunday. Thank you for hosting Science Sunday, Phyllis! Distilled water and ironing… It would take me years to use that much water in my iron. I bought a new iron last summer (or was it the summer before? ), intending to wear beautifully ironed clothes all the time. Alas, I soon abandoned that idea. Writing or ironing? It wasn’t hard to choose! Thank you for your lovely comment! I love TED talks too. I’d like to create more time in my routine to watch them. I enjoy listening to your podcasts while I straighten my hair on a Friday morning. I wonder what aspect of my routine I could link with TED talks? I’m very glad you chose writing over ironing. For years I’ve only bought clothes that look okay straight from the airer! Fun! I had to laugh at myself because I thought the top video was one your daughter had done. Imagine my surprise when I watched it and saw that it wasn’t her after all! Claire, I’m loving following your journey. You have a real gift for moving and inspiring others. LOL re the video. I think C(11) would be delighted to make a film like that. Sylvia’s very talented, isn’t she?! I’m glad to know I’m not the only one who jumps in, and is halfway through a project before I really know what I’m supposed to be showing the kids 🙂 We always use our Leapster battery holder full of AA batteries as a power source for electric playdough – I never remember to pick up a 9V. Leah – I think just jumping in is the secret to getting these sort of projects done! Yes I think a lot of AA batteries would be fine. Not the rather pathetic two AA’s I offered my son!